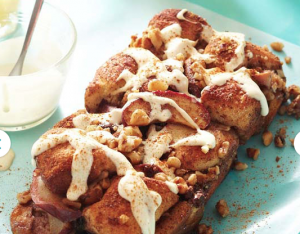 ARCHIVES: MOTHER’S DAY BREAKFAST IDEAS… | COFFEEBREAKWITHFRIENDS! how about BREAKFAST IN BED? after she enjoys all of the yummy goodies you made. Enjoy!.. Plan the perfect breakfast in bed for mom on Mother’s Day with our easy, helpful tips. If you want breakfast to be a surprise, choose a few make-ahead dishes and prep them while she’s out the night before or at a different house. Wake up early and put the finishing touches on the dishes, and then bring the tray to her for a nice breakfast surprise. You don’t have to bake Mom five elaborate breakfast dishes on Mother’s Day; getting served a homemade breakfast in bed is special even when it’s simple. Include a small bunch of her favorite flowers in a glass vase and a nice handmade card for an extra special touch. If you have small children, let them help with breakfast by choosing easy recipes, such as pancakes or French toast. 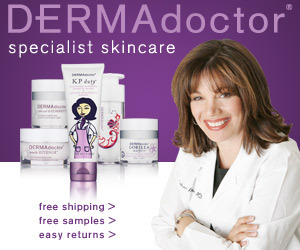 Mom will also appreciate sweet handmade gifts, such as cards or coupon booklets that relieve her of household duties. Ask Mom a few days ahead what her favorite breakfast recipes are to get an idea of what to make. If she gets suspicious of your surprise, go ahead and tell her — that way you won’t have to sneak around the kitchen early in the morning — and mom can sleep in as late as she wants. LET US KNOW WHICH ONES MOM LIKES BEST! 1.For berry topping, in a medium saucepan combine 1/4 cup granulated sugar, cornstarch, and salt. Stir in the water. Stir in 1/2 cup of the berries. Cook and stir over medium heat until thickened. Remove from heat. Add an additional 1 cup of the berries and the 1 teaspoon butter, stirring until butter is melted. Gently stir in orange peel. 2.In a medium bowl combine cream cheese and orange marmalade; beat with an electric mixer on low to medium speed until smooth. In a small bowl stir together the 2 teaspoons granulated sugar and the cardamom. 3.Toast the split pita rounds. Brush pita rounds with the 2 tablespoons melted butter; sprinkle with the sugar-cardamom mixture. Spread cream cheese mixture over split pita rounds. 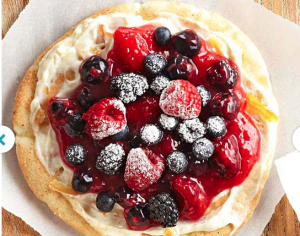 Spread berry topping over cream cheese mixture. Top with the remaining 1/2 cup berries. If desired, sprinkle with powdered sugar. If desired, make the berry topping and cool completely. Cover and chill at least 2 hours or up to 8 hours before using. 1.For filling, in a large nonstick skillet heat 2 tablespoons of the butter over medium heat until melted. Stir in potatoes, garlic, and cumin. Spread in an even layer; press down lightly with a spatula. Cook for 6 to 7 minutes or until golden brown on the bottom. Turn potatoes over; spread evenly and press down lightly. Cook for 6 to 8 minutes more or until golden brown and crisp. Stir in chicken. Remove from skillet; set aside. 2.In a medium bowl whisk together eggs, milk, salt, and black pepper. In the same skillet heat the remaining 1 tablespoon butter over medium heat until melted. Pour in egg mixture. Cook over medium heat, without stirring, until mixture begins to set on bottom and around edge. Using a spatula or large spoon, lift and fold the partially cooked egg mixture so the uncooked portion flows underneath. Continue cooking for 2 to 3 minutes or until egg mixture is cooked through but is still glossy and moist. Immediately remove from heat. 3.Stack tortillas and wrap in microwave-safe paper towels. Microwave on 100 percent power (high) about 1 minute or until heated through. Divide potato mixture among tortillas, spooning it just below the center of each tortilla. Divide egg mixture and chile peppers among tortillas; sprinkle with cheese. Fold bottom edge of each tortilla up and over filling, fold in opposite sides, and roll up from the bottom. 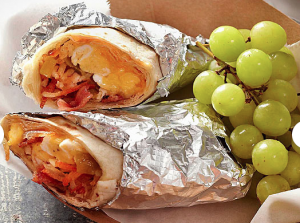 Tightly wrap each burrito in heavy foil and chill overnight. Tailgate day::4.Tote foil-wrapped burritos and salsa in an insulated cooler with ice packs. 5.At the tailgating site, prepare grill (with a cover). For a charcoal grill, arrange medium-hot coals around edge of grill. Test for medium heat above center of grill. Place foil-wrapped burritos on grill rack over center of grill, stacking slightly, if necessary. Cover and heat about 15 minutes or until heated through, turning and rearranging once halfway through grilling. (For a gas grill, preheat grill. Reduce heat to medium. Adjust for indirect cooking and heat as above.) Serve burritos with salsa. 1.Preheat oven to 350F. Coat an 8x4x2-inch loaf pan with cooking spray; set aside. Cut biscuits in half crosswise. In a small bowl combine ground flaxseeds, 11/2 teaspoons of the granulated sugar, and the cinnamon. Roll biscuits in flaxseed mixture to coat. Alternately arrange biscuit halves and apple slices in the prepared loaf pan. Sprinkle with any remaining flaxseed mixture. Top with walnuts. 2.In a small saucepan combine brown sugar, 2 tablespoons orange juice, and butter. Cook and stir over medium-high heat until boiling. Pour mixture over biscuits. Bake about 25 minutes or until edges are golden and biscuits near center are done. Cool in pan on a wire rack for 5 minutes. Invert loaf onto a small baking sheet. Invert again onto a serving platter. 3.For icing, in a small bowl whisk together cream cheese, 2 teaspoons orange juice, vanilla, and the remaining 1/2 teaspoon granulated sugar. Drizzle bread with icing. Serve warm. 1.Preheat oven to 350 degrees F. Line eight 2 1/2-inch muffin cups with parchment baking cups** or parchment-lined foil pan lining paper with the parchment side up; set aside. Prepare Perfect Hash Browns. Let hash browns stand about 20 minutes or until cool enough to handle. 2.Divide hash browns between muffin cups, pressing hash browns into the bottoms and up the sides of the cups. 3.Divide cheese among hash-brown-lined cups. Crack an egg into each cup. Sprinkle with pepper. Top each cup with 1 teaspoon of the pesto (if desired) and two of the tomato halves. 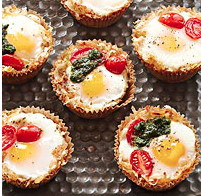 Bake for 18 to 20 minutes or until whites are set and yolks are thickened. Let stand for 3 to 5 minutes before serving. Carefully remove from cups. directions1.Peel and coarsely shred potatoes. Place potatoes in a large bowl; add enough water to cover potatoes. Stir well. Drain in a colander set over the sink. Repeat rinsing and draining two or three times until water runs clear. Drain again, pressing out as much water as you can with a rubber spatula. Line a salad spinner with paper towels; add potatoes and spin. Repeat, if necessary, until potatoes are dry. Transfer potatoes to a large bowl. Sprinkle with salt and pepper; toss to combine2.In a 10-inch nonstick skillet heat 1 tablespoon of the oil and the butter over medium-high heat until butter foams. Add potatoes to the skillet, spreading into an even layer. Gently press with the back of a spatula to form a cake. Reduce heat to medium. Cook, without stirring, about 12 minutes or until the bottom is golden brown and crisp.3.Invert a plate over the top of the skillet. Carefully invert the skillet to transfer the potatoes to the plate. If needed, add the remaining 1 tablespoon oil to the skillet. Using the plate, slide the potatoes back into the skillet, uncooked side down. Cook about 8 minutes more or until the bottom is golden brown. If desired, sprinkle with paprika before serving. Shred potatoes as directed and place in a bowl of water. Chill in the refrigeratorovernight. Rinse and continue with Steps 1 through 3 as directed. 1.Remove and discard the rind from the Brie cheese. In a medium bowl beat Brie cheese, cream cheese, sugar, and lemon juice with an electric mixer on medium speed until almost smooth. Set aside. 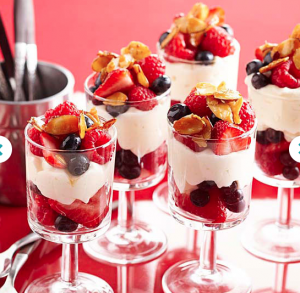 2.Layer strawberries, cheese mixture, and almonds in eight parfait glasses or water goblets. If desired, drizzle with honey. If you wish to make these parfaits ahead, do not use apples, pears, or peaches because the fruit will turn brown. Prepare the cheese mixture and fruit as directed. Cover and chill for up to 24 hours. To serve, let cheese mixture stand at room temperature for 30 minutes; Assemble as directed. Or prepare parfaits as directed. Cover and chill the finished parfaits for up to 4 hours. directions1.Preheat oven to 425 degrees F. In a medium bowl whisk together milk and eggs. Add flour, the 2 tablespoons sugar, the melted butter, vanilla, and salt, whisking until smooth. Set aside.2.If desired, peel peaches. Pit and slice peaches.3.Grease a 9- to 10-inch deep-dish pie plate. Pour batter into pie plate. Arrange peach slices on top of batter.4.Bake for 20 minutes. Sprinkle with granola. Bake for 5 to 10 minutes more or until batter is light brown and set and peaches are tender. Let cool for 20 minutes before serving. 5.Meanwhile, in a small bowl stir together yogurt and enough additional sugar to reach desired sweetness. 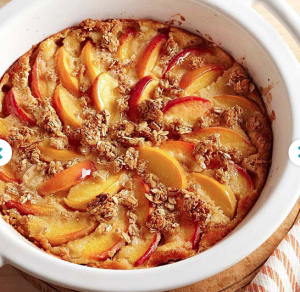 Serve yogurt mixture with peach gratin. Drizzle individual servings with maple syrup. directions1.Line a 3-1/2- or 4-quart slow cooker with disposable slow cooker liner.2.Preheat oven to 300 degrees F. Arrange bread cubes in a single layer on a baking pan. Bake for 10 to 15 minutes or until bread cubes are golden, stirring once or twice; cool. Place bread cubes in prepared slow cooker.3.In a large bowl whisk together half-and-half, eggs, granulated sugar, vanilla, cinnamon, and nutmeg. Pour mixture over bread cubes in cooker. With back of a large spoon, press bread down slightly to moisten cubes completely.4.In a medium bowl, using a pastry blender, cut butter into brown sugar until pieces are pea-size. Stir in pecans. Sprinkle pecan mixture over bread mixture in cooker. 5.Cover and cook on low-heat setting for 4 to 5 hours or until a knife inserted into the center comes out clean. Remove crockery liner from cooker, if possible, or turn off cooker. Cool mixture for 30 minutes. 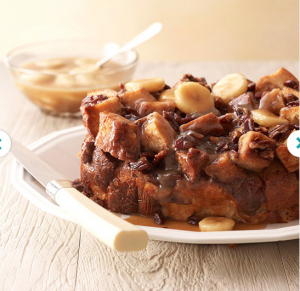 6.Serve casserole with Caramel-Banana Sauce. directions1.In a medium heavy saucepan combine brown sugar, whipping cream, butter, and corn syrup. Bring to boiling over medium-high heat, whisking occasionally; reduce heat to medium. Boil gently, uncovered, for 3 minutes more. Remove from heat. Stir in vanilla. Pour sauce into a small bowl; cool to room temperature. If desired, cover and chill in therefrigerator overnight. To serve, let chilled sauce stand at room temperature for 1 hour. Stir in banana.